Complain at your peril when it comes to the made-for-TV event between Tiger Woods and Phil Mickelson. At least that what happened to American country music singer and golf fan Jake Owen. After expressing his displeasure about being ripped off after shelling out $29.99 to subscribe to the event between the two golfing superstars, Owen wanted his money back. No-one would disagree that the match turned out to be a bit of a fizzer with “Lefty” [Mickelson] winning with a birdie on the 22nd hole. Owen explained on the BarStool Sports podcast recently that he spotted Mickelson at Jordan Spieth’s wedding and decided to have his say about the poor golf played during the much-publicised match. “I walked over to him, I was like, ‘Hey Phil, you owe me f****** $29.99 for wasting four hours of my life with the s****iest golf I’ve ever seen’,” said Owen. 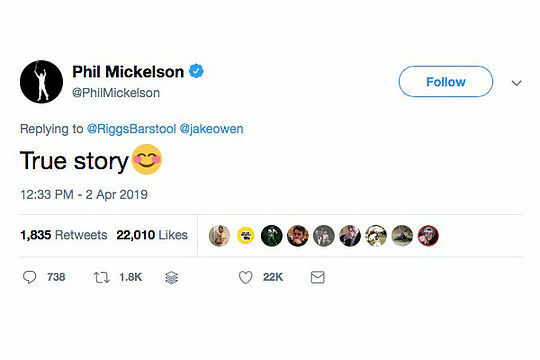 The story was confirmed by the man himself when Mickelson tweeted – “True story”. Is the Tiger vs Phil $10m match closer to reality?